Edited by Fordgalaxy, 25 November 2017 - 11:03 AM. Fried pork chops with fried potatoes and onions with sauerkraut. A staple in my home. Invite me over the next time you make it please. You are very right about that. As usual, Ford. I stopped buying pork for that reason. It used to taste good and be a lot more juicy. Now, it's awful. 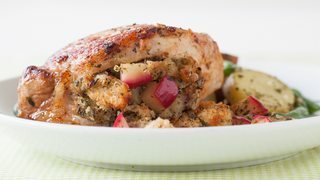 Stuffed pork chops roasted with apple slices on the top! My favorite but I'm not sure I can even make them anymore; I haven't for about a year and the market I got the extra thick pork chops from closed. A new supermarket took over but from what I understand, nearly all their meat is prepackaged at a warehouse and they don't cut meat to order in the back anymore. They do taste delicious though! Costco sells great pork chops. The best are the bone-in, which, like fat, adds flavor to the meat. I like mine grilled with a simple rub of herbs and salt. Here's a gross question: so, you've finally managed to dig out that piece of pork chop that's been stuck between your first and second premolars. How many hours will have passed for you to decide to spit it into the sink rather than just chew and swallow it? Edited by toymaker, 31 July 2018 - 08:05 PM. Here's a gross question: so, you've finally managed to dig out that piece of pork chop that's been stuck between your first and second premolars. How many hours will have passed before you decide to spit it into the sink rather than just chew and swallow it? Awhile back, I was sitting in a doctor's waiting room, and the woman across from me was relating a story to one of the nurses there .. She was glowing about the colonic she had had last time, and said that when she was about 4 or 5 years old, she had swallowed one of Barbie's shoes .. Keep in mind that this woman was in her 40s at this point by my estimation ... So during the aforementioned colonic, she said that she saw the pink Barbie shoe expelled and go thru the transparent tube and down the drain .. It's still probably tastier than a pork chop.